First things first - the nerds behind Equate were in a galaxy far far away for too long ...but now we're back! Our team has quit their full time jobs as Engineers to focus solely on nerding out on Equate. From now on, updates will happen on a regular basis - bringing you more formulas, videos and other new features! A new update will be coming out soon! Published: 2014-05-03, by Manu Galvez. 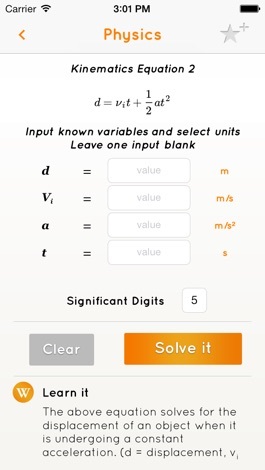 "Solve and learn... in a jiffy"
Behzad Soltani's Equate Formula Solver can be either your cribsheet or your teacher. Or actually both of them. Either if you are a professional scientist, a student or a curious mind, you may find here a life-saving source of knowledge. Equate Formula Solver features dozens of Maths, Physics and Chemistry main formulae. You can fill the variables you are given in those forms and apply the formula with a single tap. Get accurate results, compare them to yours. Learn how it made it. 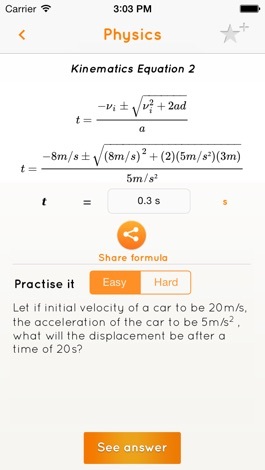 In fact, setting aside the formula solver feature - which is meaningful per se and works like a charm - one of the strongest points of the app is its educational approach. 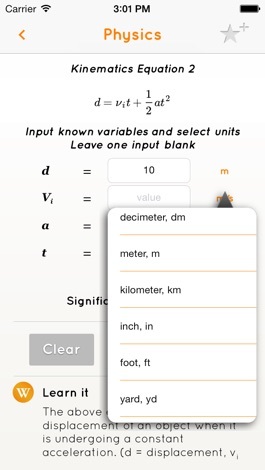 Of course, you can solve equations and use the app as a cheat sheet. However, as you do it, you'll be learning without even realizing: there are brief explanations on how the formula applies so you can get the grip on it. There's more. Although there are just three demos so far, Equate Formula Solver is adding video lecturers to explain basic concepts as Khan Academy and others already do. 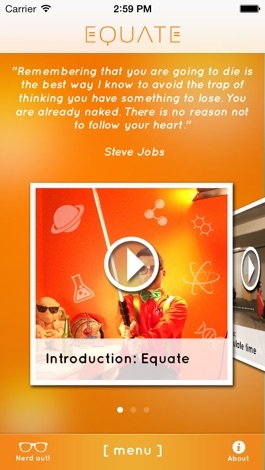 Thus, Equate is on the way to become a comprehensive educational platforms. Equate is set in a simple yet neat and smooth interface. There's no way you can get lost. Original, well-designed and educational. Highly recommended. The perfect reference tool for any student (Teachers are welcome too!). Equate is being used by over 100,000 students and teachers worldwide. Solve, learn and inspire are just some of the ways that Equate can help you explore the wonderful world of formulas. Study with Equate to dominate! - Science quotes to keep the brain juices flowing! 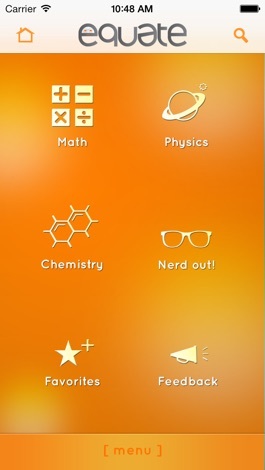 - Nerd Out! section that displays all the formulas. - Take advantage of more than 200 formulas. - New formulas added every week! Equate can be used by students, teachers and tutors. Here are some of the scientific goodness that Equate provides! Used by students and teachers worldwide! Join the formula revolution and give the power back to the students! If there is a formula you'd like to see, please let us know and we'll nerd it up and have it available. Do you see a bug? contact us and help us ensure accuracy! We are here to serve and support students and teachers. Upcoming update will include 100 new formulas and 20 more fun educational videos! Send us an email with suggestions and neat ideas and we will feature you on the app! Connect with us and watch our videos! "What did one quantum physicist say when he wanted to fight another quantum physicist? Let me ATOM!"